The new QT5 version of Stellarium 0.13.1 is now available in the testing repository. Stellarium 0.13.1 has been released! The Stellarium development team after 3 months of development is proud to announce the first correcting release of Stellarium in series 0.13.x - version 0.13.1. - Added: Auto-detect location via network lookup. Stevo wrote: The new QT5 version of Stellarium 0.13.1 is now available in the testing repository. I have enigmail and insync held. However it does install in my fresher Vbox 14.3 install. The latest 13.3 release is now available in the test repository. 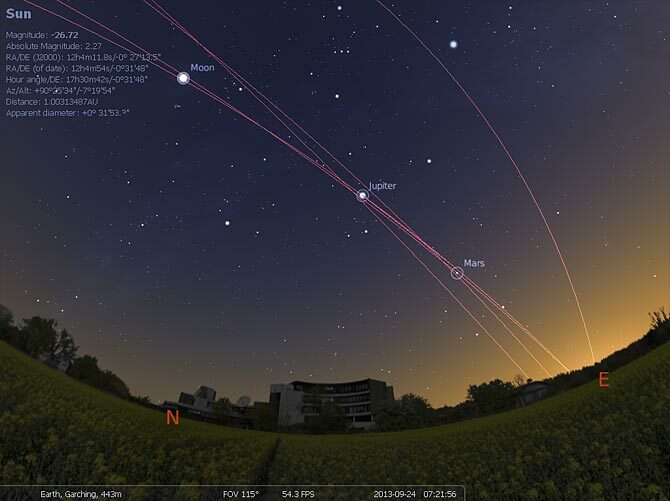 I am currently running Stellarium 0.11.3. What files must I change to upgrade to the new version using APT or Synaptic? Or is this tarball only? It should already be in your list, but disabled by default. Reload & you should see the stellarium upgrade available. After you install stellarium it would be wise to disable the testing repo again before the next time you do a full update. Okay, I removed stellarium and then re-added it with the testrepo line uncommented. After this operation, 7,661 kB disk space will be freed. Need to get 3,637 kB of archives. After this operation, 7,661 kB of additional disk space will be used. Selecting previously unselected package stellarium. However, I am back with Stellarium 0.11.3. Did I do forget to do something? Because of the way Warren set up preferences/pinning in Mepis 12, I think you might need a '-t mepis' to that command to get it to install the 0.13.3-1mcr120+1 package from the M12 testrepo. We don't need to do that in MX-14, but you do with M12. stellarium is already the newest version. 0 upgraded, 0 newly installed, 0 to remove and 46 not upgraded. User config directory does not exist:  "/root/.stellarium"
When you enabled the testrepo did you reload the repo lists with a 'apt-get update' ? Edit: seems the either way works. Good to know! If you know the exact version, (apt-cache policy <package>) another way is to specify it. Last edited by Stevo on Thu Aug 06, 2015 7:43 pm, edited 1 time in total.